A.K. Smith is the author of debut fiction novel, "A Deep Thing" (12-19-2016 from the Wild Rose Press). A.K has lived in Pennsylvania, Maryland, Delaware, North Carolina, Ohio, Indiana, Arizona and abroad in London and Mexico. She loves all things jungly, beachy and mysterious. Her mission is to write thrillers, suspense, and romance, that have the power to make you stay up late. A new scuba diver, she counts diving in a cenote (underwater caves in the Yucatan) and surviving-- one of her biggest achievements. Mexico has a special place in her heart; it’s where she escaped after walking out on Corporate America and where she fell in love on a sailboat. She is a graduate of Shippensburg University (BA) and has a Master of Arts from Indiana University of Pennsylvania. A.K. has written for various national and international publications and blogs including Flight Network, Examiner.com and has been a monthly travel columnist for Rocky Point Times Newspaper for the last six years. Published in various print publications including two cover features in Mexico Living Magazine she continues to trek the world to experience off-the-beaten-road destinations. A Deep Thing by A.K. Smith is a suspense novel about a young widow searching for her lost husband's secrets. Kendall Riggs lost her husband, Tim, over sixteen months ago in a diving accident in a cenote. She is still feeling the pain of her loss and is unable to overcome the grief that wracks her being. Life holds no meaning for her anymore. One night, in a moment of intense pain, Kendall takes a handful of pills to end it all. Realizing what she has done, Kendall runs to the bathroom and empties her stomach. When she exits the bathroom, her wedding picture falls off the wall. Kendall takes it as a sign and recognizes it is time to start living again. The next morning she starts removing Tim's items from the house. Keeping only the most important and meaningful mementos of him, she stores the rest. During the cleaning process, she discovers a metal briefcase hidden under a bookshelf. The same day, she receives a call from a dive shop in Mexico. A diving trip that Tim had planned two years ago is ready. They need Tim's confirmation of his arrival date. It soon becomes apparent that Tim had secrets that may have gotten him killed. Kendall now finds herself caught between two covert groups. They are contending with each other to acquire what they suspect Tim has discovered and hidden. A Deep Thing by A.K. Smith is a suspense story that is as exciting as a James Rollins novel. Kendall travels between Maryland, the jungles of the Yucatan and the waters of Mexico to decipher and fulfill her husband's wishes. Despite the animosity and heartache her stepson gives her, she valiantly forges ahead to finish what her husband has charged her to do. The characters were outstanding, including the villains. I found them easy to relate to. The plot is interesting and the storyline is fascinating. This is a captivating and engrossing story and I loved every bit of it. Reading this story was a pure pleasure. I recommend it to anyone who loves a good suspense novel with some ancient legends mixed in. 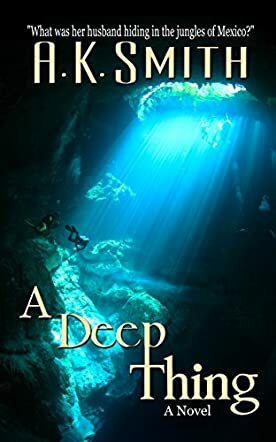 ‘A Deep Thing’ draws you in with a kaleidoscope of description, then captures your attention at the end of the first chapter with a massive hook. From there you follow the journey of the main character Kendall, as the life she thought she knew starts to fall apart around her and secrets about her deceased husband start to surface. These new found secrets take Kendall on a journey through the beautiful tropical forests of Mexico and the intriguing world of cave diving. While Kendall is searching for answers, the mystery of her husband’s secret life subtly plays out throughout the book and has you guessing until the very end. This is a well-paced suspense novel which has been brilliantly written and will have you captivated from start to finish.